Known for his mural-scale, lushly colored paintings, engineer-turned-artist Sandeep Mukherjee concocted an exhibition of paintings and drawings made specifically for the Nichols Gallery. 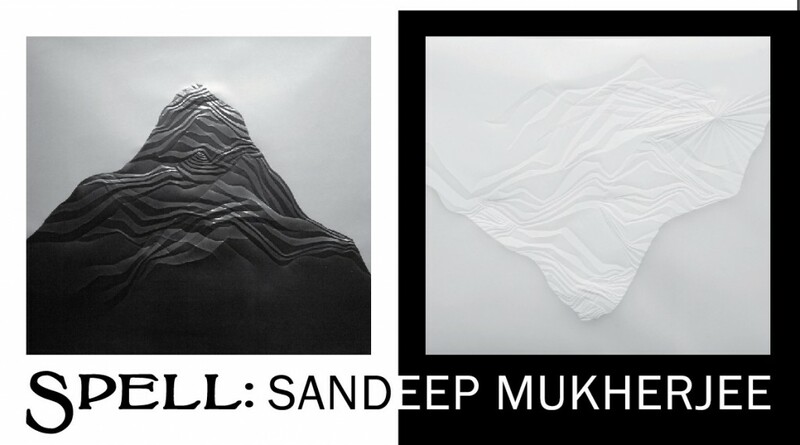 Restricting his palette to black and white, Mukherjee’s three massive horizontal works, that function in concert as well as singly, allude to the natural landscape but never conspicuously. The paintings pivot back and forth between the tangible and the ethereal, pushing and pulling between figuration and abstraction. The result is a tension between the pastoral and fantastic that attracts viewers with its peculiar magnetism. There is the seen. There is the unseen. The foundational edict of both Evangelicalism and the Neo-Romanticism is that the direct and personal bond between the individual and the great other is paramount—one concerns the interpretation of the Word, the other and the world. The rise of Evangelicalism was concurrent with Neo-romanticism and their turn-of-the-century currents are still felt today. In Neo-romanticism this tenet is illustrated through the passionate interpretation of the seen and unseen. Nature is depicted as a mysterious creature resistant to share its secrets. Evangelicalism speaks in tongues in order to articulate the whelming ecstasy for the Risen Christ. Each has its troubadours, preacher, convert, fanatic, poet, playwright, and painter. The invention of language is essential to both movements. An appropriately poetic idiom is required to capture the instinctive expressions for which there are no adequate words or symbols, and no capability to express the ineffable. The religious experience is often conducted in a communal setting and has far more tools of persuasion—song, solidarity, stage craft—at work than during the solitary contemplation of a work of art. This inadequacy of language, however, has not stopped attempts to use analogous forms to approximate the sensation of the art experience. We have Johann Wolfgang Von Goethe, mastermind of the Germanic peoples and amateur painter, writing, I call architecture frozen music, and Simonides of Ceos, lyric poet and father of mnemonics (remember this, we’ll come back to it later) attempting a similar comparison, Painting is silent poetry, and poetry is painting with the gift of speech. Still yet we have a greater authority, Balthus, weighing in on the subject, Painting is a language that cannot be replaced by another language. I don’t know what to say about what I paint, really. The problem is that painting is illiterate, not that it cannot read, of course, but in the more clearly illustrative German (and Dutch and French) word for illiterate, analphabet; not unlettered but without letters, that is letterforms, with which it might construct a notational and translatable bulletin. Instead we must rely upon its empathetic gesture, expressionist color, ritualized process and emphatic materials. We rely on the worthiness of the artist, the only resident and therefore native guide, to usher us revealingly through this world they have created, this landscape of invented physics, instincts and senses. It is in this manner that Sandeep Mukherjee attempts to create an alternative cosmology. His territory is one of surface tension and transparency, where will-o’-the-wisps are not denatured down to ignes fatui. In this land, this Mukherjia, past and present tense are the same and a line is also a volume. His mark making is often the lightest of gestures, mere creases, both concave and convex, in translucent parchment stained and pigmented with aqueous media. Sometimes brushed, often blown, onto to the surface of the paintings, his shapes feather into animals and plants that are indistinguishable from one another. Unlike the current trend of nursery realism where quirky figures are illustrated performing peculiar actions among a few fanciful rocks and trees set against an undifferentiated ground, Mukherjee’s fantastic creations don’t call attention to themselves. They all seem to be caught in the act of hiding, like a will-o’-the-wisp. He doesn’t draw faeries or hybrid plant concoctions but creates the sensation of something real glimpsed just out of the corner of one’s eye, too quick for one’s turning head. In this territory planes recede—or do not—and shapes reveal as often as overlap the others. In this terrain a flexible focal distance overtakes the traditional foreground, middle ground and background to create a concurrently immediate and gradual relation to the picture plane. This landscape is not without its consistencies. Motifs recur and serve both as a standard by which other similar visual relationships might be deciphered and mnemonic milestones by which we might make our way through the maze full of shifting solidities. For in this landscape the earth is often viscous and the ponds are made of colorful adamant tiles, and either may be rendered in an illusory ripple spectrum, sometimes solid and might be tread upon, other times liquid in which we may be immersed. Mukherjee’s visual language is one engulfed in euphoria, fully involved and trance-like and possessed of its conviction. All of these strategies are suggestive of an environment with which we are familiar but have never been. It is not a dream world but a land of déjà vu, familiar but unsurveyed. It describes itself in a visual language that is not completely foreign yet still unintelligible; it is the glossalia necessary to describe its history and cultural fables—things happen and have happened here, creating a curious and unique romance; its visual strategies speak in a gibberish tongue but we recognize it as a language and although we cannot decipher it we find it lyrical and melodic, a feat of conjuring for which there is no incantation. So it is in Mukherjia.